Whatever your age or situation, stains happen. 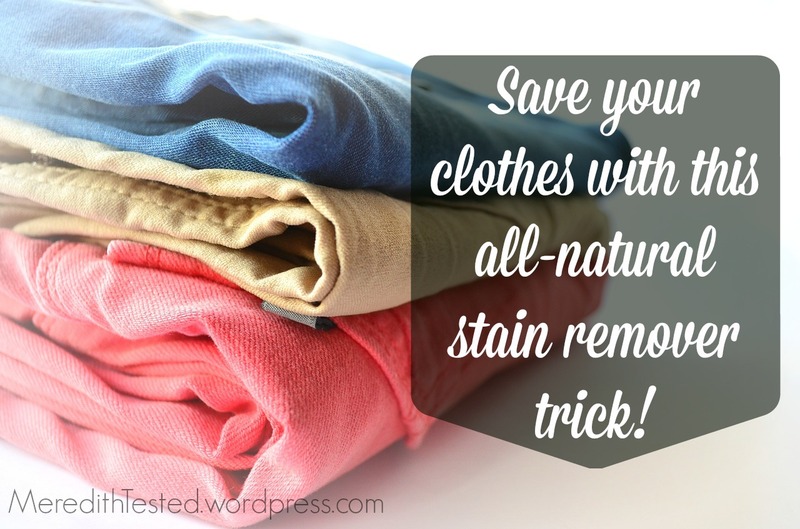 Whether your common stains are more of the chili and beer variety or butternut squash baby food, you can use this simple formula to save your clothes! Just put this mixture on the stain, let it sit for 30 minutes (or overnight) and then run in the wash like normal. Way safer and in my opinion, way more effective than bleach, a Tide pen or any number of “miracle” stain-removing formulas you can buy at the store. I’ve been using this for about a year and it’s taken out a number of mysterious stains (and not-so-mysterious … hello huge glass of red wine that spilled all over my shirt!) on lots of different kinds of fabric. If your item is particularly delicate, you may want to test out a small area that’s not very visible just in case. I don’t know how effective this would be on carpets or furniture as I’ve found running through the wash has been a necessary step. But you could try pouring a small amount on the stain and blotting with a microfiber cloth. I mix this in a small jar as needed but you can use a bowl, larger jar, etc. I recommend making it as needed versus storing it pre-made, though, since the hydrogen peroxide will turn into water eventually and won’t be effective. I’ve read lots of variations with different ratios but honestly as long as you put in some of each, it’ll work pretty well. And you’re done! You can just pour it on the stain and be done with it, but I like to rub it in a bit with a soft brush (an old toothbrush would work well) or a washcloth/microfiber cloth. One way we can live more minimally with only stuff we love and use regularly is to take care of those few items we have! No need to toss something just because it’s been stained! We’ve been amazed at how well this has taken out stains (from who-knows-what) on baby clothes we’ve received as hand me downs. I know that some of the stains had most likely been on those clothes for years, too. I am definitely going to try this…it seems I’m always splashing olive oil on myself and haven’t yet found a reliable way to get oil stains out. Thanks for sharing! Trust me, Josh and I are magnets for oil. So, you are most definitely not alone in that 😉 Also if it’s straight-up oil, sometimes just a dab of dish soap left on overnight will do the trick! Also I’ve heard sprinkling corn starch on first can help but I’m all about fewer steps hehe.